A water tank is a container for storing water. 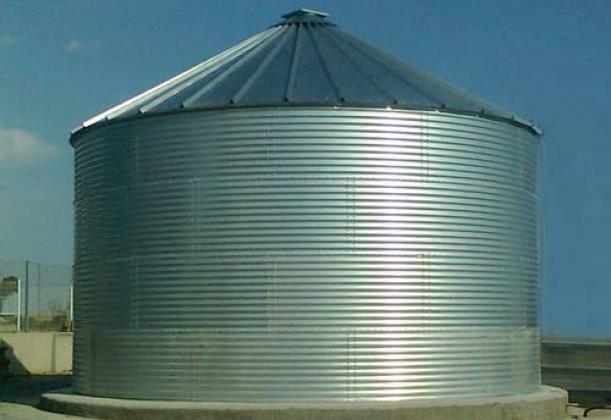 Water tanks are the solution to the problems of water supply and are used in a wide variety of fields such as irrigation, fire suppression, agricultural farming, as well as many other applications. Our water tanks are specially designed to solve needs of water storage for irrigation for any type of crop (olives, wheat, cotton, etc). They are not suitable for drinking-water. All diameters are available in one, two or three wall rings of height. Each wall ring is 1.14 m. high (for different heights, please contact our sales department). The joints are sealed with white mastic (preshape butyl sealant) of 6 mm diameter, resistant to temperatures between -30º C up to 120º C.
Built in galvanised and corrugated steel, type Z-600. The diameters vary between 3.82 and 35.91. For other dimensions, please contact our sales department. 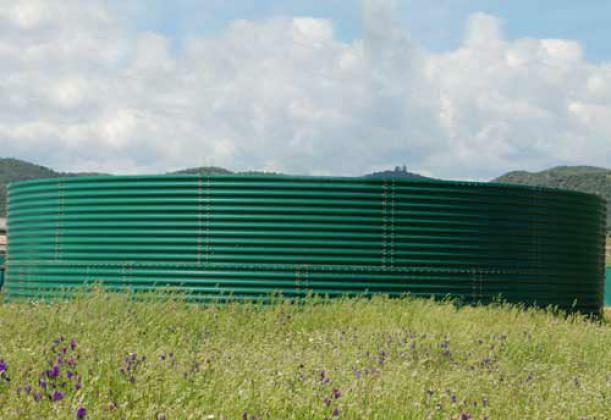 Built in green lacquered corrugated steel sheet, grey color on the inside, usually as required for water tanks located in protected natural areas, according to the environmental rules for prevention of visual impacts on the landscape. Optionally with the bottom in PVC plastic layer or with a complete inside cover on the bottom and walls of the water tank, that provides additional protection against corrosion of the sheets and reduces the cost of construction works. Accessories for the fixing of the cover are included. Optionally they can be equipped with an internal ladder, including safety rings to conform with regulations. Water tank cover. We provide a sloped roof (silo type) to cover the water tank, composed of roof panels built in galvanised steel sheet. We include a roof inspection window and access ladder. For any customised request please consult our sales department. Other information drawings, for example pipes for the drainage system, are available as well. Foundation drawings for the construction work of all types of water tanks.